Captain Cook (1728–1779) was a British explorer, navigator and mapmaker (not to be confused with fictional character Captain Hook). Henry Cooke (composer) (c. 1616 – 1672) English choirmaster, commonly called Captain Cooke or Cook after his rank during the Civil War. 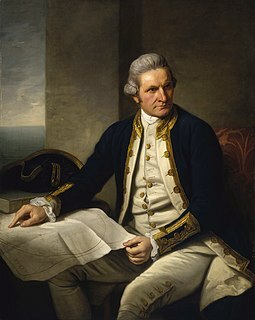 This disambiguation page lists articles associated with the title Captain Cook. Blackadder is a series of four BBC1 pseudohistorical British sitcoms, plus several one-off instalments, which originally aired in the 1980s. All television episodes starred Rowan Atkinson as the anti-hero Edmund Blackadder, and Tony Robinson as Blackadder's dogsbody, Baldrick. 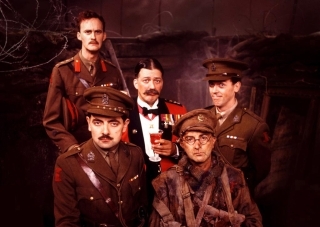 Each series was set in a different historical period, with the two protagonists accompanied by different characters, though several reappear in one series or another, for example Melchett and Lord Flashheart. "Goodbyeee", or "Plan F: Goodbyeee", is the sixth and final episode of Blackadder Goes Forth, the fourth series of British historical sitcom Blackadder. The episode was first broadcast on BBC1 in the United Kingdom on 2 November 1989, shortly before Armistice Day. Apart from the one-off short film Blackadder: Back & Forth made a decade later, it was the last episode of Blackadder to be produced and transmitted. Amos Starr Cooke was an American educator and businessman in the Kingdom of Hawaii. He was patriarch of a family that influenced Hawaii during the 20th century. John Cook was the first Solicitor General of the English Commonwealth and led the prosecution of Charles I. Following the English Restoration, Cook was convicted of regicide and hanged, drawn and quartered on 16 October 1660. He is considered an international legal icon and progenitor of international criminal law for being the first lawyer to prosecute a head of state for crimes against his people.